Newcastle United Football Club (based in Newcastle upon Tyne) was founded in 1892 by the merger of Newcastle East End and Newcastle West End. Their home ground has been St James’ Park since the club’s foundation the ground was developed into an all-seater stadium in the mid-1990s and has a capacity of 52,354. The club has been owned by Mike Ashley since 2007, succeeding long term chairman and owner Sir John Hall. The club is the 17th-highest revenue producing club in the world in terms of annual revenue, generating €169.3 million in 2015. Newcastle’s highest placing was in 1999, when they were the fifth-highest revenue producing football club in the world, and second in England only behind Manchester United. 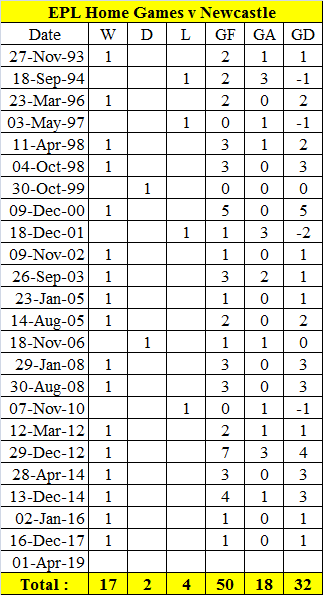 Newcastle has been a member of the Premier League for all but three years of the competition’s history and has been in the top four on five occasions. 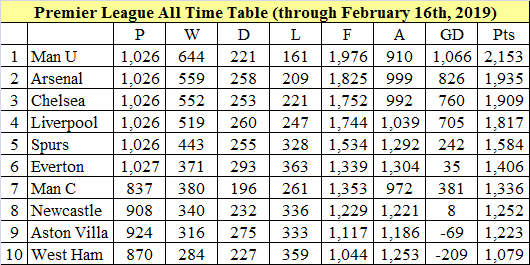 Currently Newcastle is eighth in the Premier League all time table. The club’s top goal scorer is Alan Shearer, who scored 206 goals in all competitions between 1996 and 2006. Andy Cole holds the record for the most goals scored in a season: 41 in the 1993–94 season in the Premier League. Shay Given is the most capped international for the club, with 134 appearances for Republic of Ireland. Woolwich Arsenal’s inaugural Football League appearance was played before a crowd of 10,000 at the club’s “new” ground, the Manor Field in a Division 2 game against Newcastle United on September 2nd 1893 and ended in a 2-2 draw. Here’s a Arsenal History match report of that first ever game in the Football League. Arsenal has won 17 of our 23 home games against Newcastle with the last loss coming on November 10, 2010. Hopefully our good home form will see us over the line against the barcodes. This entry was posted on Saturday, March 30th, 2019 at 7:50 am and is filed under Uncategorized. You can follow any responses to this entry through the RSS 2.0 feed. You can leave a response, or trackback from your own site. You are an output machine, GN5. Thanks again. Kennedy, Radford, Storey, McKlintock in the same picture — what’s not to like? Asprilla, Ginola, Shearer, Ferdinand, Philippe Albert, Beardsley, Rob Lee and David Batty. Halcyon days for the Mags, that’s for sure. Another marvellous Post GN5!! thank you. Thanks for an informative post. I did a project in Newcastle recently and it is such a nice place with a real passion for the beautiful game. They deserve better results and silverware but it looks like they missed the boat and would need a big financial injection to compete at the top again. Still with Benitez they have a good manager and if he is willing to stay they could build something… who knows. I am glad we are playing them on Monday at THoF but that will leave us with five tough away games and just two home games after that…. it will be nail-biting finish to the season, no doubt. Keep them coming, GN5! This is a game that we should win, the team are rested and the worst injury they could have is sunburn. As TA pointed out it’s going to be a tough run in with 4 teams separated by only 4 points looking to occupy only 2 positions. We are the only team not to play against another top 6 team, which should give us an advantage, but our 5 away games are scary. Yes my grandfather did watch the first game at Highbury – he rarely missed a game. He was the local N5 coal man (horse and cart) and he lived on Stavordale Road so it was a 10/15 minute walk to Highbury – these days it’s only a 2/3 minute walk to the Emirates. I believe you now deserve a statue! Thanks for you historical compilations. They always add something even fanatics don’t know. 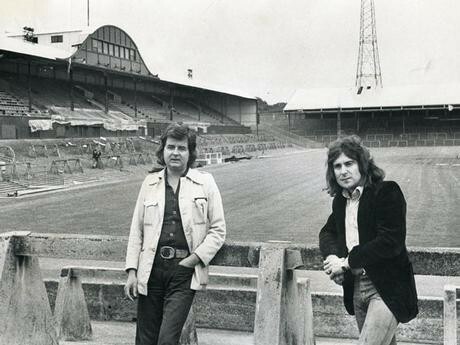 Old pictures of our beloved Highbury always stir emotions. What was the biggest crowd you stood in at Highbury? In my early days the capacity ” fluctuated ” apparently due to those who found other ways in other than to pay. Remember an FA Cup replay (certainly against a London team – possibly QPR) when the reported crowd was 63,000 to 64,000. When the Headmaster heard about the replay, he immediately sent a letter home to parents informing them that the school would be closed for the day, as he” expected most of the students would be going to the game anyway”. Wouldn’t get away with now! 3-1 for me on Monday, despite the danger of the FAT SPANISH WAITER parking the bus. Can I share something (a poem) written by a 10 year old girl that has been seen by millions on twitter. 10 years old — eh, caramba!! OK, now read it from the bottom line upwards. It made me wonder, look and then laugh………..